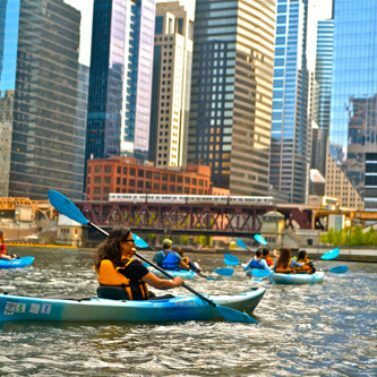 ENJOY A DAY OF KAYAKING THROUGH DOWNTOWN CHICAGO! This two hour kayak tour guides you from the early years of the city to the present as we paddle through the picturesque urban canyon of the downtown Chicago River. 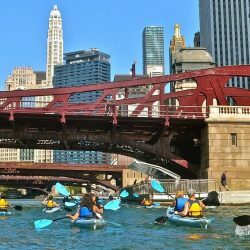 Soak up the sights and history along the bustling corridor of the recently renovated riverwalk promenade, and experience an unmatched view of our ever-developing city of skyscrapers! 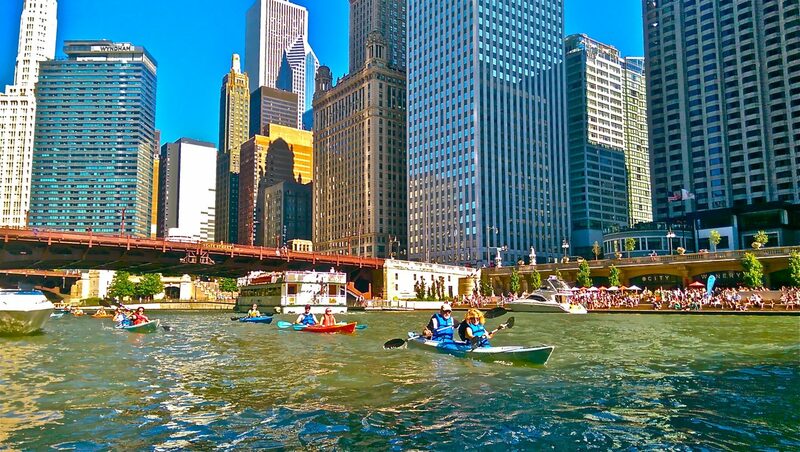 Learn about the major players in the development of early Chicago, the river’s outsized significance to the city’s meteoric growth, how colossal engineering feats shaped the cityscape, why the river flows in reverse, and much more. 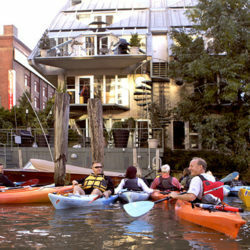 During the excursion, kayakers enjoy passing under the many unique, articulated ironwork bridges (the second largest operational drawbridge system in the world! 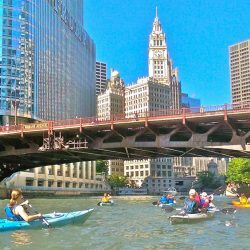 ), the always-entertaining shoreline people-watching, and the wildlife that has been drawn back to this majestic downtown segment of the Chicago River. 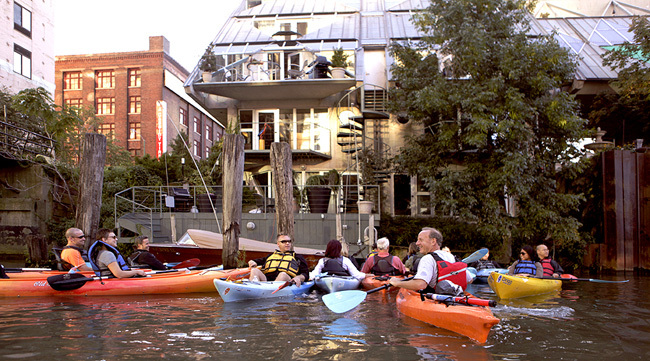 Comfortable, water-friendly clothing and shoes are suggested, as you will likely get wet. Denim not recommended. Dress for the weather on the day of the event. Hats and sunglasses are a good idea. 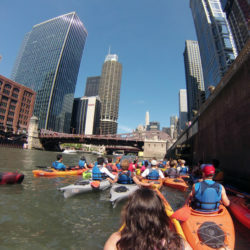 At the beginning of every tour, we teach the basics of flat water kayaking and brief our guests on river safety in a 10 minute orientation session. 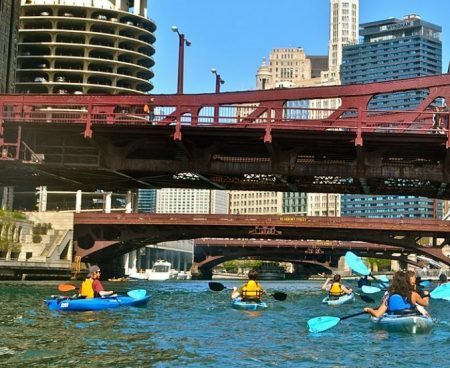 After launching, our guides will lead you on a paddling journey through the city on a curated route designed to showcase the best vistas and historically significant buildings on all three branches of the river. 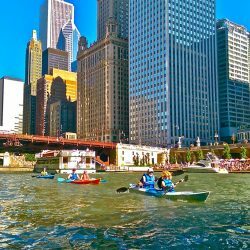 At various points on the river, we group up to learn about how Chicago went from an outback trading post to a bustling metropolis in less than half of a century! 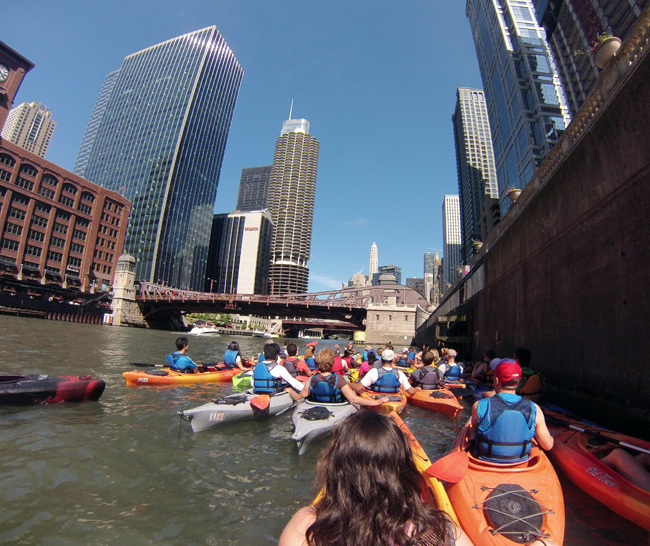 During the stops, we help explain the strong links between the Chicago River and the city itself. Larger-than-life personalities are the standard here, from the first fiddle playing, unofficial mayor, to the early boosters whose investments drove major development, to the pioneers and innovators of industry who established Chicago as a world-class city. In addition, prominent buildings are discussed for their historical and architectural significance. Take in your surroundings from the peaceful platform of a sea kayak. 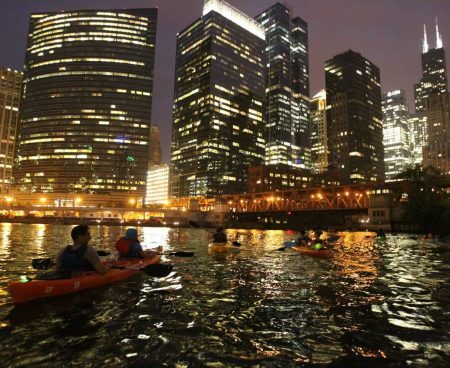 Savor the atmosphere as you glide through Chicago’s spectacular interior skyline. Many amazing photos are waiting to be captured and shared along the way. 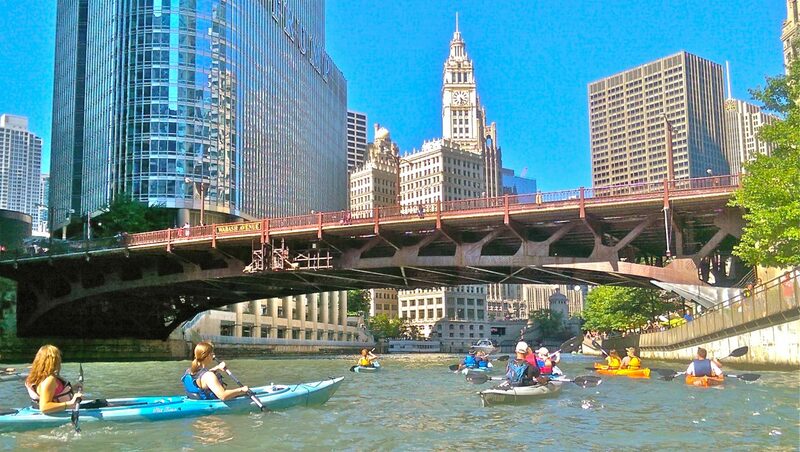 We'll finish with a beautiful panoramic view of the skyline, and then we paddle back to the dock where we started. 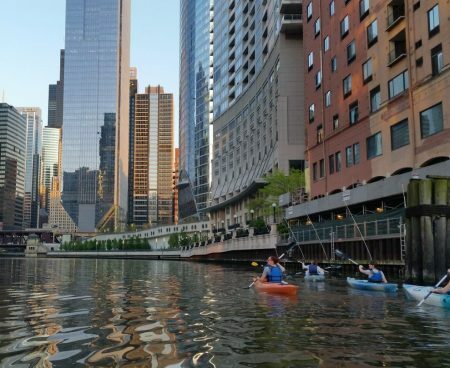 Grab your belongings, say your goodbyes, and enjoy some food and drink at one of the many nearby restaurants in River North if you’ve worked up an appetite! Pedro-n-Vida: They did a great job explaining. Everyone was awesome, and most importantly, it was an amazing location. Totally recommend it for anyone!